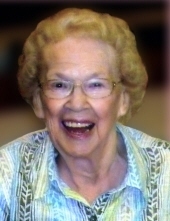 Betty Gann passed away peacefully at 98 years old on November 3rd in Midland Michigan. She was a long-time resident of Midland, most recently at Riverside Place in downtown. Betty was born in Grand Rapids on March 7, 1920 to Glen Cable and Bernice Townsend Cable. She spent much of her adult life in Midland and was employed by Northwood University for many years eventually retiring from the bookstore. She will be lovingly remembered by her son Robert (Kathy) Gann, daughter-in-law Karen Gann, sister in law Barb Cable, and grandchildren Kristie (Scott) Maiers, Steve (Rose) Gann, Mike (Danielle) Gann, Sherry (Derek) Fisch, and David (Ann Marie) Gann. She was also very proud of her 9 great grandchildren that survive. In addition, Betty had a lifelong bond with a very special nephew and niece, Mike and Stephanie Gann, which included her care in later years. The family would also like to thank a very special friend and care taker Patty Shaffer whom Betty adored. Betty was preceded in death by her parents, son Richard Gann, great grandson Brandon Gann, brother Jack Cable, and former husband Ken Gann. Betty was known for her love of the Detroit Tigers and politics. She was always well informed on both subjects and enjoyed nothing more than long discussions on these subjects. She also enjoyed spending time with her family, especially during the holidays where she was known for making the world’s best Seven Layer Salad. In keeping with her wishes, Betty will be cremated and buried in Midland. There will be a celebration of Betty’s life in the spring. Arrangements have been entrusted to the care of the Ware Smith Woolever Funeral Directors, 1200 West Wheeler St.
To plant a tree in memory of Betty Gann, please visit our Tribute Store. "Email Address" would like to share the life celebration of Betty Gann. Click on the "link" to go to share a favorite memory or leave a condolence message for the family.